It might have been hard to imagine winning a logo contest for her Virginia farm when she was sitting on the beach in San Diego, but Patricia Glaeser knows life has a way of changing in ways you might never expect. Like so many Loudoun residents, Glaeser and her husband Karl moved the family to the county for a mix of lifestyle and employment opportunities. They bought Faith Like a Mustard Seed Farm nearly seven years ago and have worked through a series of changes and innovations. The farm’s logo has kept pace with the changes. The original was hand-drawn by Patricia’s sister, Laura De Angelis, and then digitized for use on their website and social media accounts. Every aspect of the graphic came with obvious and not-so-obvious meaning. “The mustard seed is captured in the form of the mustard seed flowers,” Glaeser explained. “They represent having faith that a tiny mustard seed can grow into a magnificent towering plant when given love and care. “The laurel leaves represent eternal glory, special achievement, success and triumph. Also, both my sister (Laura) and my daughter (Lauren) have names derived from the laurel leaf. The original logo included a pig in the animal stack, as pigs were originally raised on the farm. When the Glaesers transitioned into hosting events, particularly weddings, it was a good business decision to pivot away from pig production. They gave their pigs away to another local farmer but continue to source their pork products from Loudoun farms. Naturally, they adapted the logo in order to reflect the changes. Other business changes have included pivoting away from weekend brunches in order to focus more on weddings and large events. Faith Like a Mustard Seed Farm is one of dozens of wedding venues contributing more than $118 million to the Loudoun economy each year and $7.1 million in state and local taxes. That’s the essence behind our “Future of Packaging” event on May 15, as part of Loudoun Small Business Week 2018. 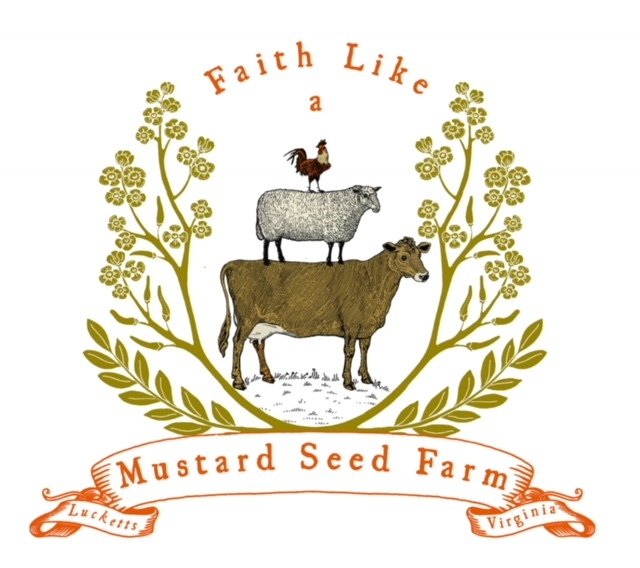 As an award for winning the logo bracket contest, Faith Like a Mustard Seed Farm will co-sponsor the event, which will feature branding insights from Steve Mackey of Mesh Omnimedia and Notaviva Vineyards.